Caption: Ski Dubai,an indoor ski resort at Mall of the Emirates in Dubai. 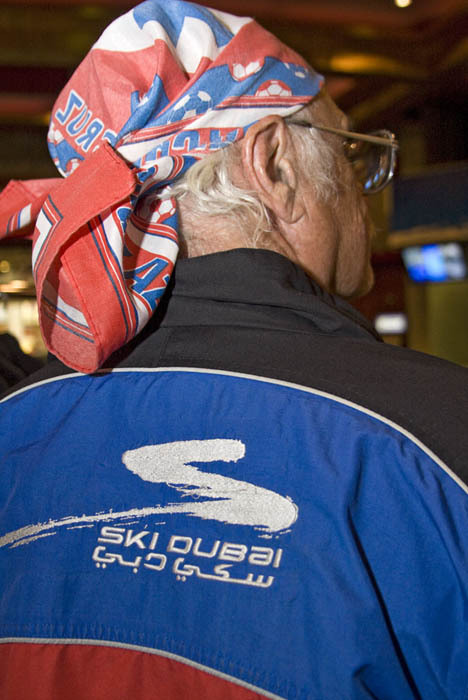 Comments: Jacket worn by skiers at Ski Dubai. Ski Dubai is an indoor ski resort with 22,500 square meters (5.6 acres) of indoor ski area. It is a part of the Mall of the Emirates, one of the largest shopping malls in the world, located in Dubai, United Arab Emirates. Opened in November 2005, the indoor resort features an 85-meter (280 foot) high indoor mountain with 5 slopes of varying steepness and difficulty, including a 400-meter-long (1,300-foot-long) run and a 90-meter-long (300-foot-long) quarter pipe for snowboarders. A quad lift and a tow lift carry skiers and snowboarders up the mountain. Adjoining the slopes is a Snow Park play area with sled and toboggan runs. Winter clothing, ski and snowboard equipment are included in the price of admission. An extremely efficient insulation system helps the faciity maintain a temperature of ?1 °C (30 °F) during the day and ?6 °C (21 °F) at night when the snow is produced. Nevertheless, the facility consumes 3000 gallons of oil each day.